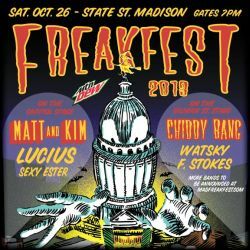 Madison Concert Ticket Giveaway: Freakfest 2013 | True Endeavors Presents: music, tours, tickets, mp3 downloads, concert pictures, videos, Madison WI. Post a comment by 10:00 pm tonight (Thursday, September 19) telling us about your favorite Halloween costume(s) of all time. These could be your own, or costumes you’ve seen other revelers wearing. Just tell us about what made these getups striking, funny, spooky, or cool below for a chance to win a ticket for you and a buddy. Ed Gein custom with three skin suits on hangers. That made it both funny and spooky . Only in Wisconsin would someone make an Ed Gein costume. My wife was a dirty laundry basket. She cut a hole in the middle of a basket and pulled it up to her waist and filled it with clothes. She had one leg in each pair of pants and the rest draped in the basket. One sleeve of different shirts on each of her arms and the rest in the basket. She cut a bleach bottle to make a hat. (She kind of looked like the tin man!) To top it off, she drank her bottle of wine out of a detergent measuring cup. A man dressed in a tight dark suit, shirt unbuttoned to his navel. He had Velcro-attached Barbies in bikinis on his jacket. He was a chick magnet! I saw a really great group costume several years ago. One person had a giant rearview mirror rigged up on a shoulder harness and attached to that by rope were two people dressed as fuzzy dice. These are great! e6gMan wins it this time. Congrats!